For over 110 years, Takeo Mihoncho has sold unique types of paper and gained many international fans. In this article, we will introduce you the world of Takeo's papers. Fans of Japanese stationery items will love this store! For many years, the Japanese have been fond users of paper for various purposes, ranging from Japanese art, literature, bills, interior decoration, furniture and more. Along with washi paper, modern types of paper with unique patterns and designs have lately spread throughout Japan. This time, we will like to introduce you to Takeo Mihoncho, a shop known for its vast collection of papers from all over Japan. Takeo is a shop specialized in paper, which has been in operation for over 110 years. The many types of paper they carry have unique colors and textures. Among all, the special type of paper called "fine paper" has been highly appreciated by popular artists from all over. With a strong fan-base, paper conventions were held not only Japan but also in Milan and Taipei. At the entrance of the shop, there is a pamphlet called "PAPER'S" featuring interviews with famous Japanese artists such as Taku Satō and Kenmei Nagaoka. So, what are the types of paper that so many professional artists like? Let's take a look at the papers sold at Takeo. On the first floor, you will see a collection of 2,700 types of paper aligned according to color gradients. It is an impressive sight to see such vibrant colored paper in a simple white room. If you find a paper that you really like, you will be able to purchase it in A4 size on site. Once you have found one to your liking, go through several of the samples. When you look at the paper closely, you will find various characteristics in the design, texture, and feeling of each sheet of paper. We felt rather overwhelmed with the variety, but this time, we selected a unique marbled pink paper. On the back, you will find the price, suggestions on how to use the paper, and the stock location code. The sample is in the size of a card, but when you purchase it, you will be receiving an A4 size paper. When you bring the sample to the counter, the staff will bring the larger sheet down from the shelf. All the shelves in the store have stocks of the various types of paper. Each shelf has a code written on it, and the staff is able to find the requested paper using the stock code. The patterns on the paper that were pulled out from the shelf are all slightly different, so look through the actual sheets to find the one that you like best. Takeo not only carries paper but also carries envelopes, notebooks and other stationery items made from paper. Envelopes with a lovely texture would be great to use when sending a letter to someone. After selecting your paper, let's head to the second floor. 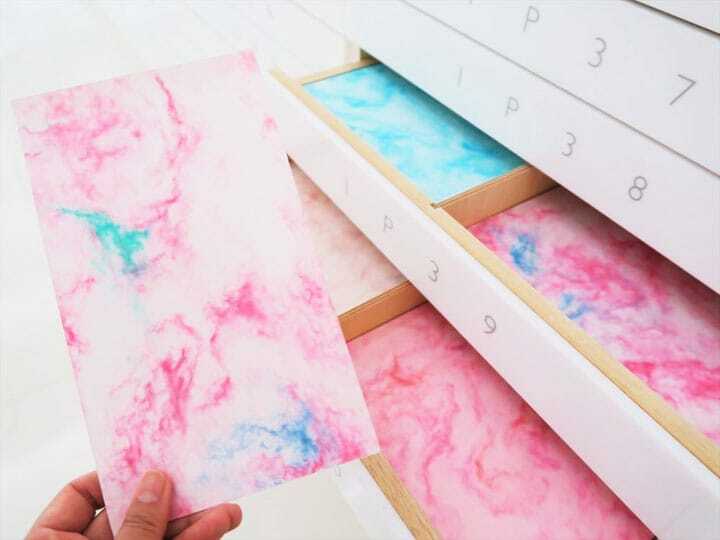 On the second floor, you will find a permanent display called the "Sample Paper Collection" where you can find products and packaging using paper from Takeo. There also are some limited time paper exhibitions held several times a year. In this exhibition, you will find paper bags and pamphlets from popular shops all over the city. We were very surprised to see Takeo's papers being used in nearby locations. Mimizudo Shop, located in the display area is a shop opened by a bookmaking studio in Nagano that carries unique tools and items to make books. This cute and tiny book is a miniature book card stand. It is used to store business and name cards, but it might be fun to write something in it too. Did you enjoy discovering the unique experience of selecting papers at Takeo Mihoncho Honten? Each sheet of paper has its own characteristic, so time flies very fast when you are going through so many types! After finding your personal favorite, it might be fun to use it as wrapping paper or paper crafts. On your next visit to Tokyo, why not spend a special moment selecting lovely paper? Akihabara Travel Guide: Visit Japan's Electronics And Otaku Center!